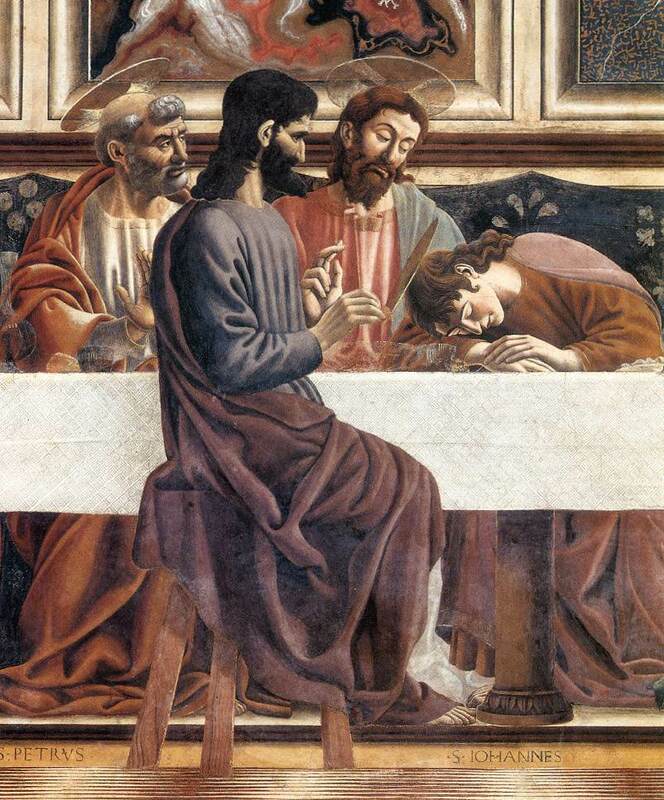 The Last Supper by Domenico Ghirlandaio and detail below. 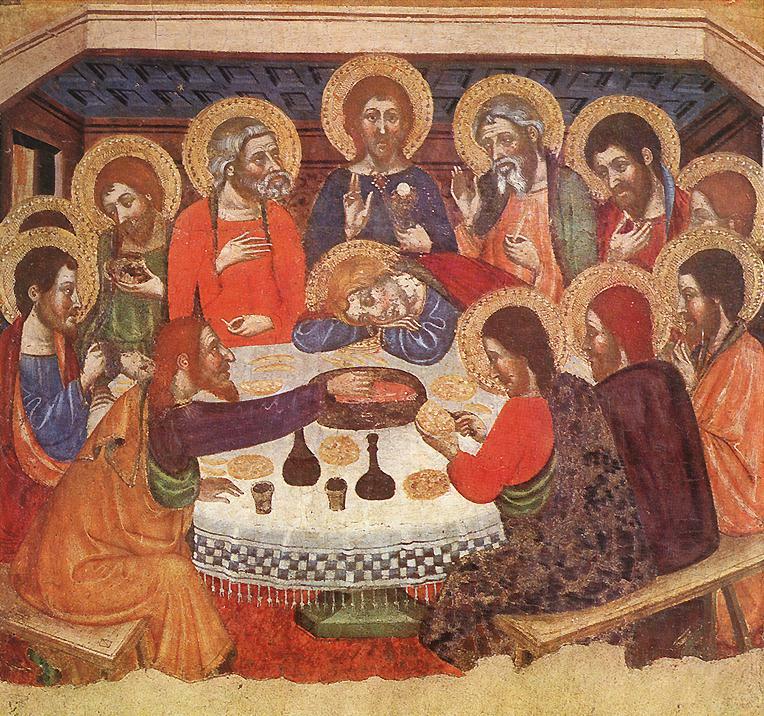 Jesus makes the same hand gesture in painting after Last Supper painting. Hermetic Last Suppers like Da Vinci’s, painted throughout the Renaissance, point to the truth using Cabalistic language and symbols. This particular gesture appears again and again. 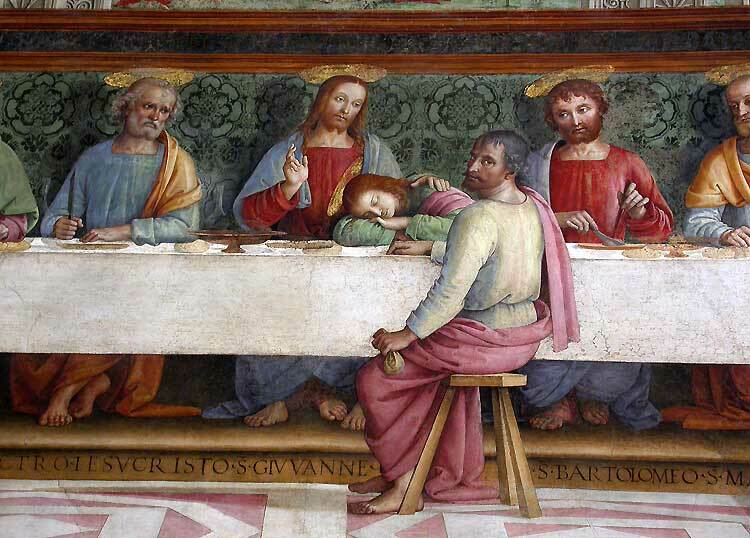 And when it appears it points to John, asleep at the center of the table. This gesture represents the truth. It refers, in particular, to the so called first truth of Hermetic Philosophy, represented by the statement As above, so Below. Here “above,” as heaven, is likened to earth “below.” This gesture, directed at the woman John, suggests that the corelation between heaven and earth must include John who, as the Beauty of the Sacred Feminine, sits at the center of the table and at the center of the Tree of Life. In short, the dual nature of heaven is just like the dual nature of earth; both male and female. 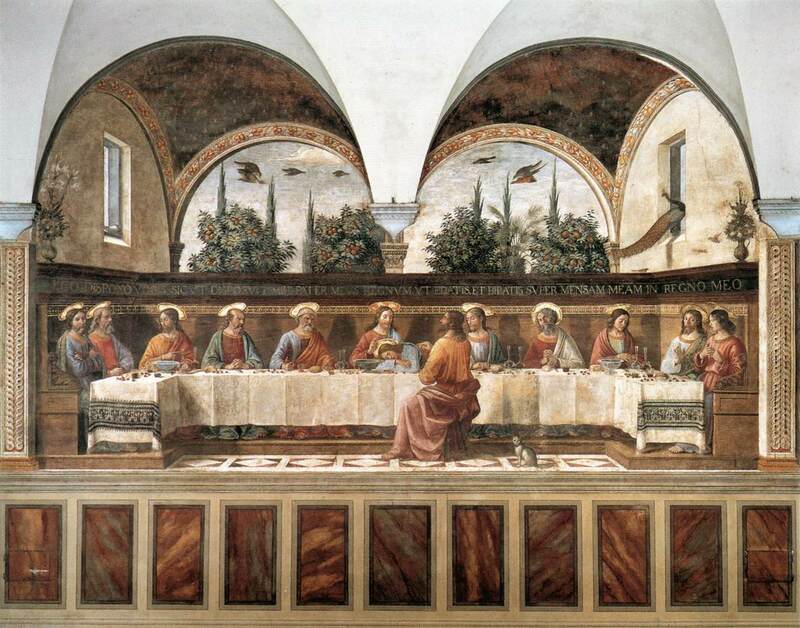 Da Vinci painted many androgenous Johns before the clearly female Baptist of his Last Supper. These Johns often hold up a forefinger pointing toward heaven. So often, in fact, that it has its own name. It is called the John Gesture. The meaning of the gesture has been variously interpreted over the years. One possible meaning of John’s gesture may simply be to remind us of the prophet who came first. A first prophet teaches others. It follows, then, that Jesus was a student of John’s, despite New Testament assertions that John was only a humble forerunner. 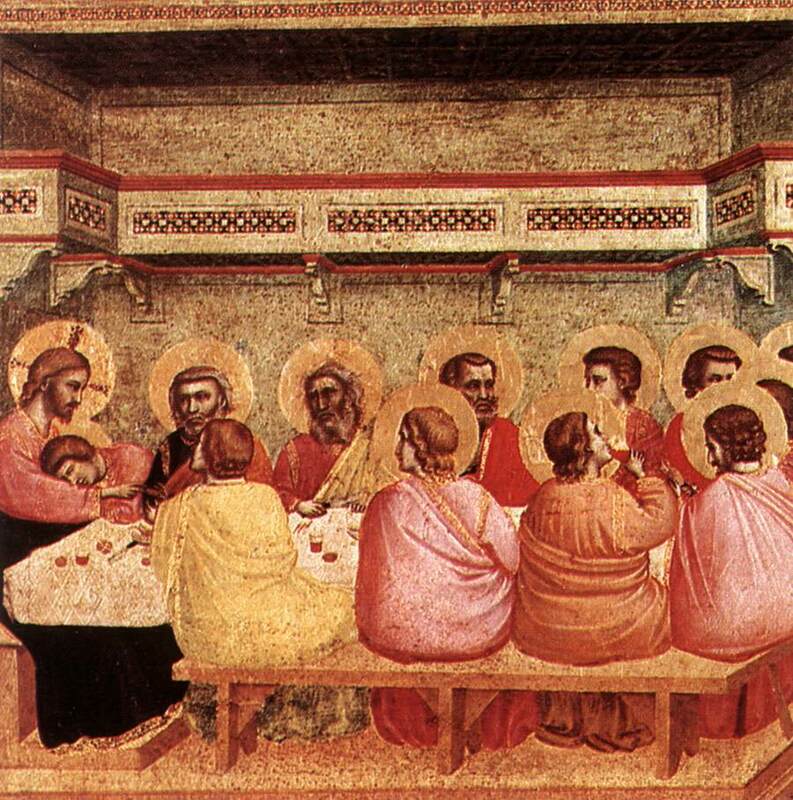 The two fingered Hermetic gesture that Jesus directs at John, in so many Last Supper works, may be seen in the Tarot. In key 5 below, the Hierophant advances knowledge. 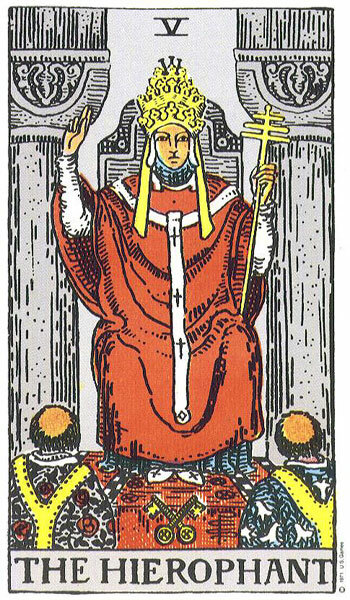 The Hierophant, as master Magician, uses this esoteric gesture as symbol of the truth received from inner and outer instruction. He represents self mastery and, as such, is prepared to enter the garden of the Lovers to join with Beauty, in position 6… where they meet the Godhead in Eden. The Hierophant, as the illumined masculine, is Beauty’s groom. 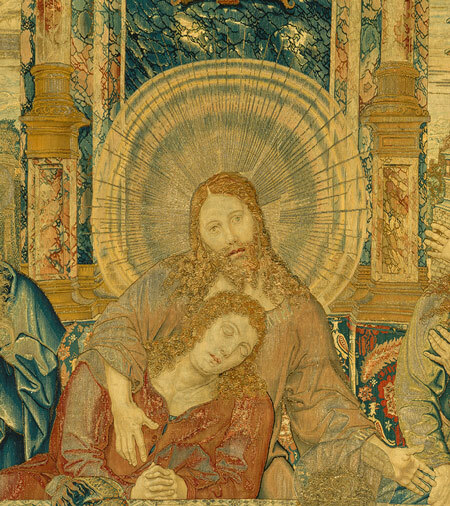 Jesus appears, in dozens of Last Supper works, as the Hierophant … with his sleeping Beauty. In the painting below da Vinci omits the gesture. 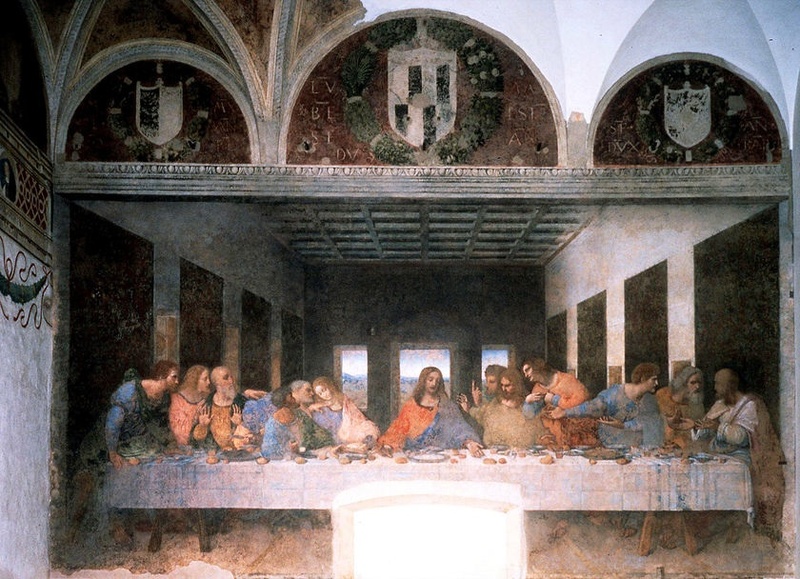 Later, we will look at Leonardo’s Last Supper, and observe the special attitude he takes toward Jesus in this work… by using a different hand gesture. 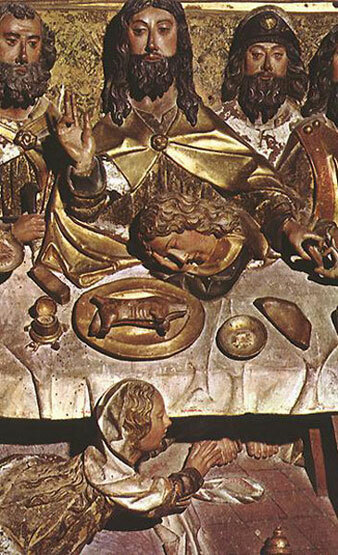 For the moment note the wide use of the gesture, in works of Last Supper art, throughout the Renaissance era. 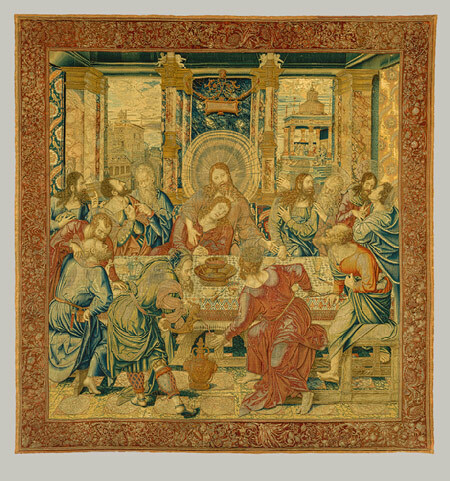 Bernard van Orley created the weaving above in the early 16th century. 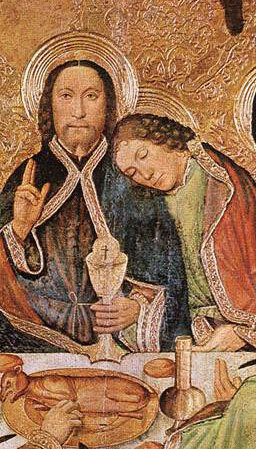 He does not use the usual Hermetic hand gesture above the sleeping John. 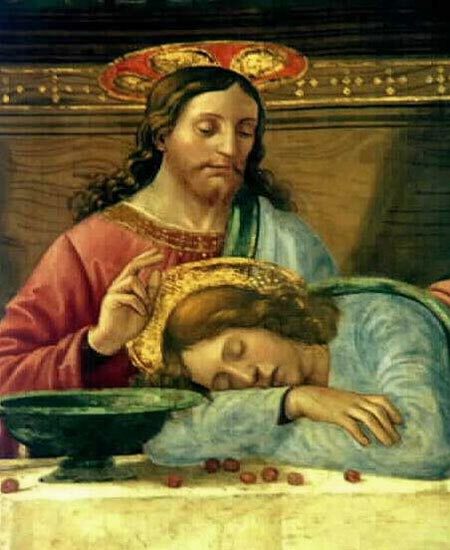 Instead Jesus rests his hand on John’s breast. This work, perhaps above all others, shows the couple as sacred lovers.